Often a classic Pissaladiere is confused with pizza, which is rather odd and they are so different, A Pissaladière is a savory, onion tart layered with olives, anchovies, and herbs famous from the southern region of Provence but is so popular though you will find it on sale throughout the whole of France and further afield. The tart is served in many different ways, as a lunch dish, in pieces as a snack or in a lunch box and is cut into smaller squares and served as a canape or appetizer. Grabbing a slice of Pissaladiere is considered fast food which brings a whole new meaning to the term. Add the onions and demerara sugar and sauté, frequently stirring, until the onions become tender and start to turn golden at this point, be very careful not to burn the onions as this can leave a very bitter taste to the whole dish. Sprinkle the cooked onions with salt, pepper, and thyme. Stir the mixture and transfer the skillet to the preheated oven. Cook for 20-30 minutes, occasionally stirring, until the onions are wilted, very soft, and are a medium gold throughout, again check for burning. Add the vinegar during the last 5 minutes of cooking. Remove from the onions from the oven and set them aside to cool while preparing the pastry for the pissaladiere. Raise the oven temperature to 425F. Press the thawed pastry into a rectangle on a 12-inch by 18-inch baking sheet, building it up a bit around the edges. Spread the pastry with the onion confit, leaving 1 inch of dough uncovered around the edges of the pastry. 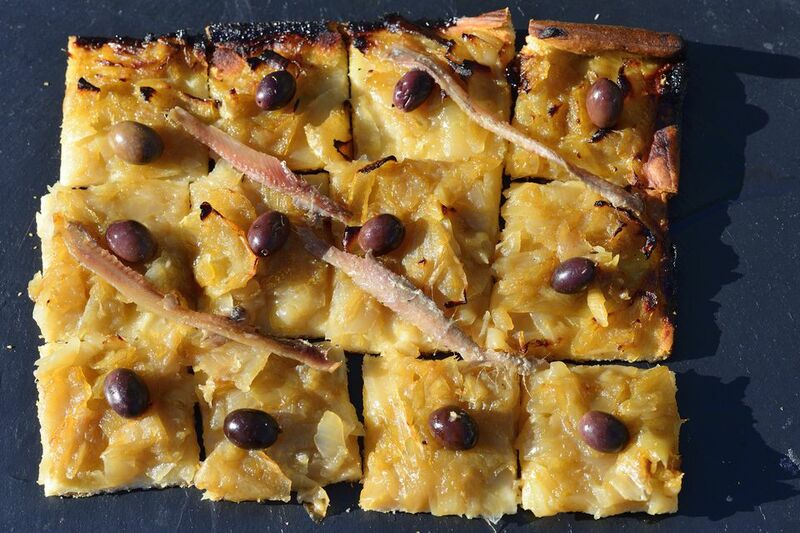 Arrange the anchovy fillets and olives on the pissaladière in a criss-cross pattern then place an olive into each rectangle pattern to make an attractive looking tart. Bake the tart for 15 to 25 minutes in the center of the heated oven until the pastry has puffed up, turned golden, and crisped. Remove the pissaladière from the oven and sprinkle the olive oil and fresh thyme across the hot surface of the tart. Cut it into rectangles and serve very warm or at room temperature. To pack into a lunch box or for a picnic, leave to go cold but do not put in the refrigerator as this deadens the flavor. Cook’s note: Be very careful to cook the onions gently. One bit of burned onion will give the whole recipe a bitter flavor.